Hosted and facilitated by Laurentina. 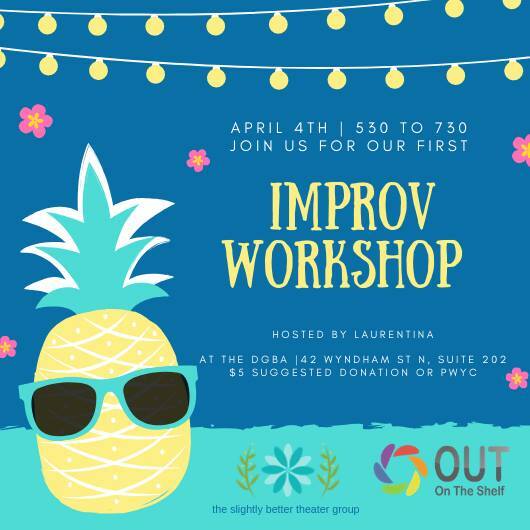 Please join us for our first ever improv workshop! Hosted and facilitated by our fabulous partner Laurentina. This is an all inclusive, all levels event - everyone is welcome! Gain some improv skills and learn something new. If you're already an improv expert show off your skills to the group. In this event we will be discussing starting an improv troupe led by Laurentina. This is our first improv event so participants will have the input on where we can take this! Let us know your interests! Laurentina is an actor, writer, and therapist who has been teaching improvisational theatre for over ten years, and performing for almost thirty. She has taught and performed in ten countries on four continents. She has a Bachelor’s in Drama from the University of Guelph, ATCL in Speech and Drama from Trinity Guildhall, and a Master’s in Expressive Arts Therapy from the European Graduate School.